Yummy treats for dogs and cats, all natural cat treats, shrimp treats, chicken treats, tuna dash, tuna flakes, gourmet cat food seasonings, made in USA pet treats. Even the most finicky cat won't turn up their nose at delicious freeze dried real meat treats - healthy and natural! Treats There are 3 products. All-natural delectable treats for cats and dogs. No additives, no preservatives - just the way Mother Nature intended! These treats taste good and are good for your cat! From treats to help with urinary tract problems to hairball remedy treats to treats that help with a stinky litter box, you'll find them all here. Feed your cat something delicious and nutritious! Inaba Ciao Cat Treats use only FDA food grade meats in their cat treats, so you can be sure you're giving your cat only the best. 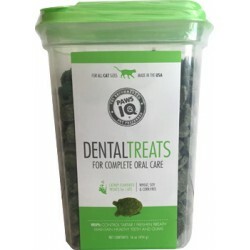 PawsIQ Dental Treats have a dental formula that helps control tartar and freshen breath. What’s more, these treats are also high in protein and have a crunchy texture that cat's go crazy for, making them the preferred choice for treat time. 1 pound container! Real ahi tuna - freeze dried into delicious little bits for your kitty! Made in USA. Delicious and nutritious! 1.1oz resealable pouch. 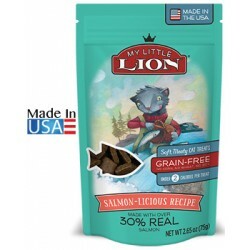 My Little Lion Salmon-licious Recipe Cat Treats are fit for a king - soft and meaty and packed with protein with a taste cats love! 2.65oz. resealable pouch.